Asen, Robert 2018. Introduction: Neoliberalism and the public sphere. Communication and the Public, Vol. 3, Issue. 3, p. 171. Gerver, Mollie 2018. Refugee Repatriation and the Problem of Consent. British Journal of Political Science, Vol. 48, Issue. 04, p. 855. Pennington, Mark 2015. Realistic Idealism and The Project of Political Economy. Economic Affairs, Vol. 35, Issue. 3, p. 366. 1 John Dewey, The Child in the Curriculum  and The School and Society  (Chicago: Chicago University Press, 1956), 7. 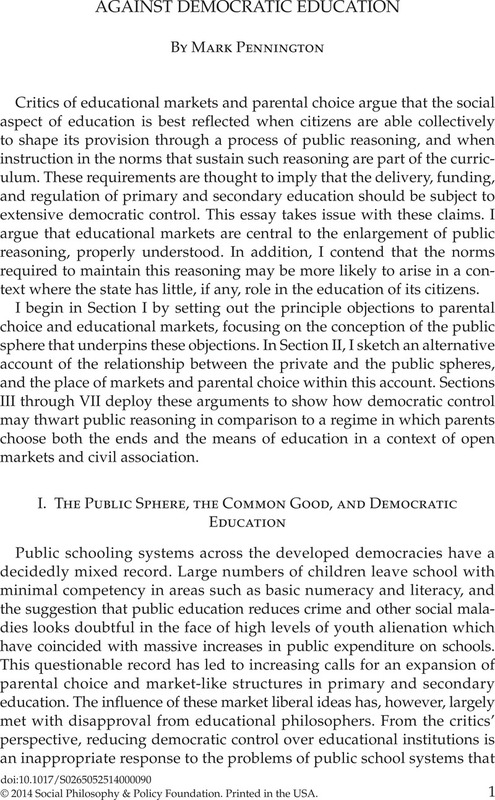 2 Amy Gutmann, Democratic Education, revised paperback edition (Princeton, NJ: Princeton University Press, 1999). 3 Gutmann cites here the work of Charles Fried. See Fried, Right and Wrong (Cambridge, MA: Harvard University Press, 1978). 4 Milton Friedman’s case for school vouchers is cited here. See Friedman, Milton, Capitalism and Freedom (Chicago: Chicago University Press, 1962). 5 Gutmann, Democratic Education, 31. 6 Brighouse, Harry, School Choice and Social Justice (Oxford: Oxford University Press, 2000). 8 Anderson, Elizabeth, “The Ethical Limitations of the Market,” Economics and Philosophy 6 (1990): 179–205. 10 For example, Lubienski, Chris, “Whither the Common Good? A critique of home schooling,” Peabody Journal of Education 75, nos. 1–2 (2000): 207–32; Cuban, Larry and Shipps, Dorothy, eds., Reconstructing the Common Good in Education (Stanford: Stanford University Press, 2000). 11 Brighouse, School Choice and Social Justice, 133–34. 12 For an example of this claim, see Brian Barry, Political Argument (London: Routledge and Kegan Paul, 1965): 133–34. 13 For example, Lubienski, “Whither the Common Good?”; Cuban and Shipps, Reconstructing the Common Good. 15 For example, Gutmann, Amy and Thompson, Dennis, Why Deliberative Democracy? (Princeton: Princeton University Press, 2004). 18 See also Macedo, Stephen, “Liberal Civic Education and Religious Fundamentalism: The Case of God v. John Rawls?” Ethics 105 (1995): 468–96. Callan, Eamonn, Creating Citizens (Oxford: Oxford University Press, 1997). 19 Lomasky, Loren, Persons, Rights, and the Moral Community (Oxford: Oxford University Press, 1987), chap. 5. 21 On this, see Smith, George, The System of Liberty (Cambridge, UK: Cambridge University Press, 2013), 61–63. 22 Smith, Adam, The Theory of Moral Sentiments (Indianapolis: Liberty Fund, 1982), 80–81. 23 See Hayek, Friedrich, The Counter-Revolution of Science, (Indianapolis, IN: Liberty Press, 1957). 24 On this, see Friedrich Hayek, The Constitution of Liberty (London: Routledge, 1960), 10. See also Mark Pennington, Robust Political Economy (Cheltenham: Edward Elgar, 2011), chap. 3. 25 Friedrich Hayek, “The Use of Knowledge in Society,” in Individualism and Economic Order (Chicago: Chicago University Press, 1948). For a more recent statement, see Friedman, Jeffrey, “Taking Ignorance Seriously: Rejoinder to Critics,” Critical Review 18, no. 4 (2006): 467–532. 26 Friedrich Hayek, “The Meaning of Competition,” in Individualism and Economic Order; Friedrich Hayek, “Competition as a Discovery Procedure,” in New Studies in Philosophy, Politics and Economics (London: Routledge, 1978). Also, Israel Kirzner, The Meaning of Market Process (London: Routledge, 1992); and John Mathews, Strategizing, Disequilibrium, and Profit (Stanford, CA: Stanford University Press, 2006). 27 This is a central finding of public choice theory, on which see James Buchanan and Gordon Tullock, The Calculus of Consent (Ann Arbor, MI: University of Michigan Press, 1962). 28 On this, see for example Tebble, Adam, “The Tables Turned: Wilt Chamberlin versus Robert Nozick on Rectification,” Economics and Philosophy 17 (2001): 89–108 ; and Pennington, Robust Political Economy, chaps. 5 and 6. 29 Again, public choice theorists have done much to understand these dynamics. 30 On this see Friedrich Hayek, Rules and Order (Chicago: Chicago University Press, 1973). 31 See in particular Kukathas, Chandran, The Liberal Archipelago (Oxford: Oxford University Press, 2003): 128–30. 32 The actions, as opposed to the free speech, of communists, fascists, and Nazis would thus need to be constrained, with the added exception of constraints on the incitement to violence. 33 Kukathas, Liberal Archipelago, 136–37. 34 If anthropogenic climate change poses the threat to social life that many experts think it does, then this may be a case in point. 35 Edwin West, Education and the State (Indianapolis: Liberty Fund, 1994); also, James Tooley, Reclaiming Education (London: Continuum, 2000). 36 Gutmann, Democratic Education, 13–15. 37 Anderson, “Ethical Limitations,” 200–201. 38 For a discussion of this see Tooley, James, Education without the State (London: Institute of Economic Affairs, 1996). 39 These arguments do not imply that all state systems are equally ineffective. In societies with high levels of social capital, for example, the propensity of public officials to engage in acts of corruption/special pleading may be much lower than elsewhere. This may explain why the Swedish state has a better record than southern European countries and the United States in the educational field. The argument presented here, however, suggests that a market system would perform even better in Swedish conditions because it has the added advantage of overcoming the epistemic problems that face centrally planned systems. In the Swedish case, moreover, it is worth noting that high levels of social trust predate the creation of the large-scale welfare state that has developed since the 1960s — on this see, for example, Sanandaji, Tino, “Poverty and Causality,” Critical Review 24, no. 1 (2012): 51–59. 40 Andrew Coulson, Markets versus Monopolies in Education: A Global Review of the Evidence, Cato Policy Analysis No. 620 (Washington, DC: Cato Institute, 2008). Coulson’s is one of the few examinations of “school choice” measures that distinguishes between “choice-oriented” reforms that exclude most of the basic constituents of a private market — such as direct consumer payment — from those that do include such measures. Many studies that purport to show no or only minimal improvements in outcomes from “choice-oriented” reforms are irrelevant to the case for a free educational market because most such reforms come nowhere near approximating the processes that such a market would permit. Kenneth Howe, “Evidence, the Conservative Paradigm, and School Choice,” in Walter Feinberg and Chris Lubienski eds., School Choice: Policies and Outcomes, (Albany, NY: SUNY, 2008) offers the type of study Coulson criticizes in this regard. 41 For example, Friedman, Capitalism and Freedom. 42 Buchanan, James and Stubblebine, Craig, “Externality,” Economica 29 (1962): 371–84. 43 West, Education and the State offers a detailed analysis and critique of the classical economists’ views in this regard. 44 West, Education and the State. See also Coulson, Andrew, Market Education: The Unknown History (London: Transaction Books, 1999). 45 Milton Friedman, “Are Externalities Relevant?” in Edward West ed., Nonpublic School Aid: The Law, Economics and Politics of American Education (Lexington, MA: D. C. Heath and Co., 1976). 46 The work of Tooley and Dixon is particularly instructive — see for example, Tooley, James, Dixon, Pauline, and Olaniyan, Olanrewaju, “Private and Public Schooling in Low Income Areas of Lagos State, Nigeria: A Census and Comparative Survey,” International Journal of Educational Research 43 (2005): 125–46. 47 I thank Harry Brighouse, Michael Cholbi, and Randall Curren for helpful discussions on this point. 49 Friedrich Hayek, Rules and Order, 114–15. 50 Note, I am not suggesting that all people should secure education by paying a market price. Rather, I am suggesting that there should be a removal of those measures and structures that block the emergence of market prices. People may, for example, “homeschool” their children and thus not pay a market price as such. On the view advanced here however, the decision to engage in home-schooling may be better informed in a context where parents can observe the results of a wider educational market in which prices have not been suppressed via legislative action. 51 Friedman, Jeffrey, “Popper, Weber, and Hayek: The Epistemology and Politics of Ignorance,” Critical Review 17, nos. 1–2 (2005): 1–58 , offers a detailed discussion in this regard. See also J. Friedman, Taking Ignorance Seriously. 52 John Dewey, The Public and its Problems (Chicago: Swallow Press, 1954): 207–8. 53 Gutmann, Democratic Education, especially chap. 3. 54 Michael Polanyi, Personal Knowledge, (New York: Harper and Row, 1964) remains the seminal text in this regard. 55 Dewey, The Public and its Problems, 207–8. 56 Dewey himself had a strong preference for localized democratic control in the context of a specifically face-to-face form of deliberation — for example, Dewey, The Public and its Problems, 213. 57 Gutmann, Democratic Education, 116–18. 58 Brighouse, School Choice and Social Justice, chaps. 4 and 5. 59 On this, see Kukathas’s defense of “pure toleration” against Brian Barry’s critique —Kukathas, Liberal Archipelago, 145–46. 60 Gutmann, Democratic Education, 39. 61 For a related discussion, see Kukathas, Liberal Archipelago, 128–30. 62 On this see Michael Hogg and Scott Tindale, eds., Blackwell Handbook of Social Psychology: Group Processes (Oxford: Blackwell, 2001). 63 See Jeffrey Brennan and Loren Lomasky, Democracy and Decision (New York: Cambridge University Press, 1993). 64 Gutmann, Democratic Education, 117–18. 67 For example, Lomasky, Rights, Persons, and the Moral Community, 172. 68 Gutmann, Democratic Education, 128–29. 69 On this argument, see Lomasky, Rights, Persons, and the Moral Community. 70 This is a view associated with the “luck egalitarianism” of Ronald Dworkin. (Dworkin, “Equality of Resources,” Philosophy and Public Affairs 10, no. 4 (1981): 283–345. 71 This is a view associated with John Rawls. See Rawls, A Theory of Justice (Cambridge, MA: Harvard University Press, 1971). 72 I thank an anonymous referee for this example. 73 Brighouse, School Choice and Social Justice, 134. 75 See, for example, Wallace Adams, Education for Extinction (Lawrence, KS: University Press of Kansas, 1995). 76 Brighouse, School Choice and Social Justice, 131 and 135. 77 Hayek, Constitution of Liberty, 42–46. See also Harold Acton, The Morals of Markets and Related Essays (Indianapolis, IN: Liberty Fund, 1983): 120–21. 78 The exceptions here clearly pertain to extreme cases of physical and mental disability. 79 Brighouse, School Choice and Social Justice, 161–62. 80 Gutmann expresses this view even more strongly in Amy Gutmann and Dennis Thompson, Democracy and Disagreement (Cambridge, MA: Belknap Press, 1996). 81 On this, see Somin, Ilya, “Deliberative Democracy and Political Ignorance,” Critical Review 22, nos. 2–3 (2010): 258. 82 On this, see Somin, “Deliberative Democracy.” See also Brennan and Lomasky, Democracy and Decision; and Guido Pincione and Fernando Tesón, Rational Choice and Democratic Deliberation (New York: Cambridge University Press, 2006). Also, Jason Brennan, The Ethics of Voting (Princeton, NJ: Princeton University Press, 2011). 83 Gutmann suggests that capacities to engage in democratic deliberation would be of limited value unless the state secures a sufficient number of “well paying” jobs, “preferably through a full employment policy” (Democratic Education, 153, note 49). From the perspective of this essay, this is exactly what no state can guarantee. There is good reason to believe that state planners cannot access, even in principle, the knowledge pertinent to the generation of sufficient numbers of “well paying jobs,” so there is no way that access to such jobs can be a “perfect right” of justice. 84 The work of Easterly shows that there is often a negative correlation between the receipt of development assistance and economic growth in many poorer nations; see William Easterly, The White Man’s Burden (Oxford: Oxford University Press, 2006). 85 Gutmann, Democratic Education, 31. 87 Henrich, Jospeh, Boyd, Robert, Bowles, Samuel, Camerer, Colin, Fehr, Ernst, Gintis, Herbert, McElreath, Richard, Alvard, Michael, Barr, Abigail, Ensminger, Jean, Smith Henrich, Natalie, Hill, Kim, Gilwhite, Francisco, Gurven, Michael, Marlowe, Frank, Patton, John, and Tracer, David, “Economic Man in Cross Cultural Perspective: Behavioural Experiments in Fifteen Small Scale Societies,” Behavioural and Brain Sciences 29 (2005): 795–855. 88 Brennan and Lomasky, Democracy and Decision; and Pincione and Tesón, Rational Choice. 89 Diana Mutz, Hearing the Other Side (New York: Cambridge University Press, 2006), especially chaps. 2 and 4.